If you sew using independent patterns, like we do, you’ve probably noticed that these patterns are almost exclusively designed for women. (As a woman who likes to sew things for herself, I can’t say I’ve ever minded this too much.) Bucking that trend is Thread Theory, an indie pattern company out of Canada that specializes in menswear. Their line of wardrobe staples helps to fill the void for men who like to sew, and for women who like to sew for them! Jason in his Thread Theory Jutland Pants, ready to work hard! Bonnie recently made a pair of the Jutland Pants for my husband, Jason. He works on a farm, and as the person who regularly mends his pants, I can tell you that his clothes take a beating. 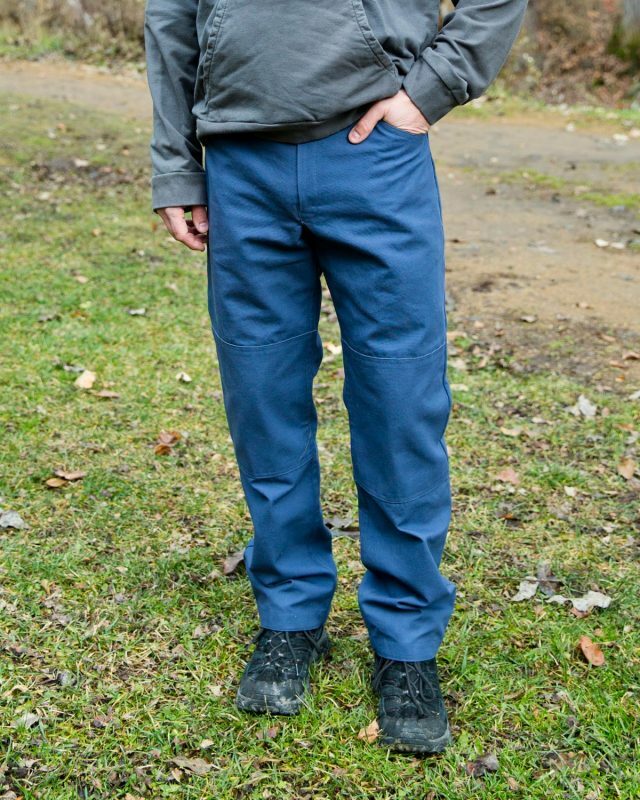 The Jutland Pants are designed to be rugged and useful, similar to the Carhartt workwear many of us are used to. The pattern features useful design elements such as patch or cargo pockets, reinforced knees and hems, and an optional lining. For this version, Jason requested the back patch pockets but not the cargo pockets, and did want the reinforcements. The Jutland Pants can be made with welt pockets or patch pockets. All versions have waist darts. Bonnie made this pair in Robert Kaufman Big Sur Canvas in Slate Blue. This fabric is itself a workhorse: It’s 100% cotton and 9.6 ounces per yard, which gives it great structure and durability. Because the fabric is quite heavy, some areas with multiple layers became a little difficult to sew. Keep this in mind if you’re not sure your sewing machine can handle it! The version made here is not lined, but just for fun Bonnie used a contrasting quilting cotton for the pockets. Jason opted for the reinforced knees and hem…two areas that get worn out quick in his line of work! Jason is approximately 5’9″ and normally wears a size 30 in pants. Bonnie used a pair of his jeans that fit him well to gauge what size to make, but note that this pattern tends to run large. The Jutland Pants are designed to be full-cut for ease of movement and to accommodate a lining. Because Jason didn’t need them lined, and likes a slimmer fit, Bonnie ended up taking the sides seams in about 2″ and shortening the overall length by several inches. Thread Theory generally has great instructions, and starting December 1st will have a Jutland sew-along on their blog! Plus, they have a wealth of tutorials and other resources if you get stuck. Sewing pants can be intimidating; Bonnie recommends this pattern for the Intermediate/Advanced sewist, and suggests making a muslin first for a better fit. 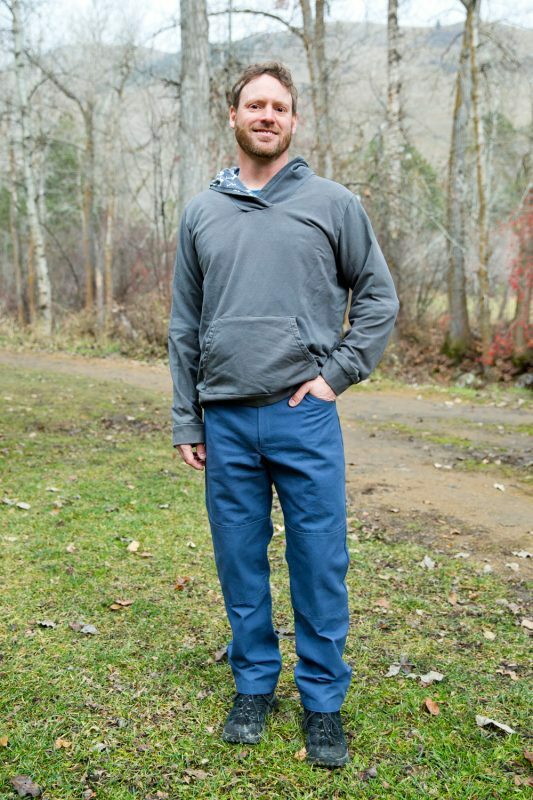 The Jutland Pants might be made for utilitarian purposes, but they sure do look good! I imagine Jason will get lots of wear out of his during the farming season and beyond! This entry was posted in Pants, Pattern Reviews and tagged Jutland, Menswear, Thread Theory.